German tosafist of the second half of the twelfth century. He was the pupil and son-in-law of R. Eliezer b. Natan (RABaN), and brother-in-law of R. Joel b. Isaac ha-Levi. He is often cited by his father-in-law in his work "Eben ha-'Ezer" (§§ 27, 28, etc. ), and also by Zedekiah b. Abraham in his "Shibbole ha-Leḳeṭ" ("Hilkot Semaḥot," § 23 [ed. Buber, p. 176a]). Some novellæ by him are mentioned in "Haggahot Maimuni" on "Hilkot Ishot," xxiii. 14. 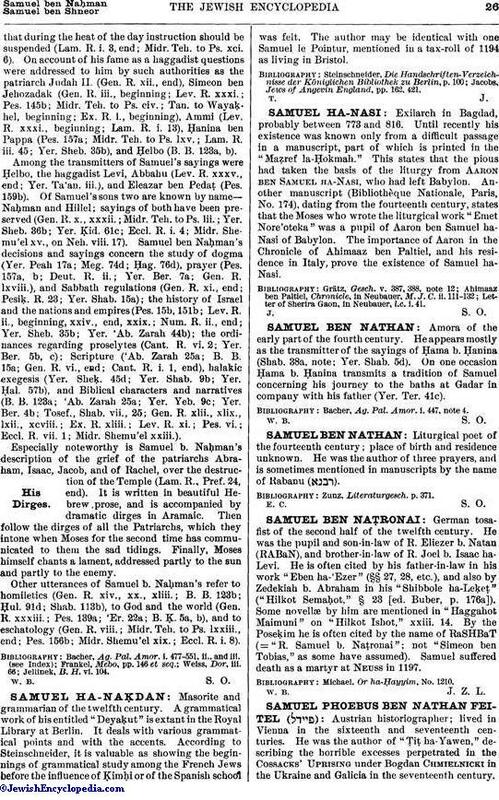 By the Poseḳim he is often cited by the name of RaSHBaT (= "R. Samuel b. Naṭronai"; not "Simeon ben Tobias," as some have assumed). Samuel suffered death as a martyr at Neuss in 1197. Michael, Or ha-Ḥayyim, No. 1210.